Human Chorionic Gonadotropin is an injectable drug available commercially in the United States as well as many other countries. Pregnyl, made by Organon, and Profasi, made by Serono. Among athletes, HCG is used to stimulate natural testosterone production during or after a steroid cycle which has caused natural levels to be reduced, often stacked with clomid for even better results. Stopping a steroid cycle abruptly, especially when endogenous androgens are absent, can cause a rapid loss in the athlete's newly acquired muscle. When HCG is used to stimulate natural production, a notably pronounced crash may be avoided. This product is also not picked up on steroid tests, so some athletes use it to keep androgen levels high before a contest that has drug testing. HCG must be refergerated after it is mixed together, and it then has a life of about 10 weeks. It is taken intramuscularly only; this drug is often available by order of a physician if you show symptoms of hypogonadism. 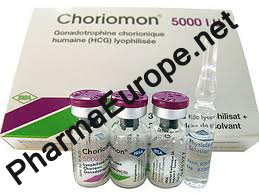 Human Chorionic Gonadotropin is an injectable drug available commercially in the United States as well as many other countries. Pregnyl, made by Organon, and Profasi, made by Serono. Among athletes, HCG is used to stimulate natural testosterone production during or after a steroid cycle which has caused natural levels to be reduced, often stacked with clomid for even better results. Stopping a steroid cycle abruptly, especially when endogenous androgens are absent, can cause a rapid loss in the athlete's newly acquired muscle. When HCG is used to stimulate natural production, a notably pronounced crash may be avoided. This product is also not picked up on steroid tests, so some athletes use it to keep androgen levels high before a contest that has drug testing. HCG must be refergerated after it is mixed together, and it then has a life of about 10 weeks. It is taken intramuscularly only; this drug is often available by order of a physician if you show symptoms of hypogonadism.